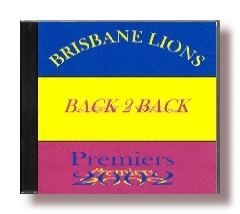 To celebrate Brisbane Lions Football Club winning "Back To Back" AFL premierships, the Unsung Heroes have released a new tribute song titled "BACK 2 BACK (Lions 2002)". In your email, please include the number of copies you wish to order, plus your name, address and contact details. Note: By sending your email, you confirm your order for the number of copies you have specified at the nominated price. Please allow 7 - 10 days for delivery upon receipt of payment.